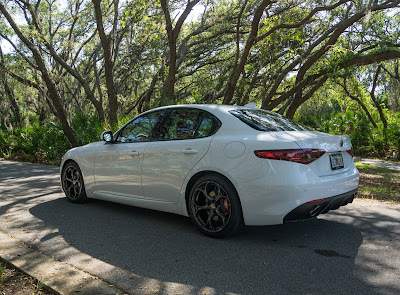 I'll try to summarize my first impressions of driving the new Alfa Romeo Giulia Ti in this post. 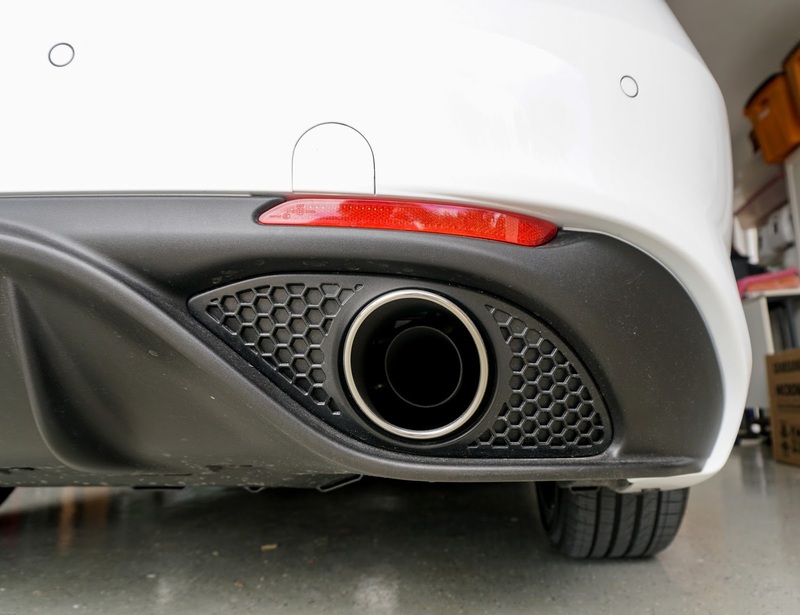 I'm using the word 'try' because it isn't easy to convey in words how this car feels. Like the feeling you get with your favorite sneakers, you know you want to put them on because you hardly know they are on. 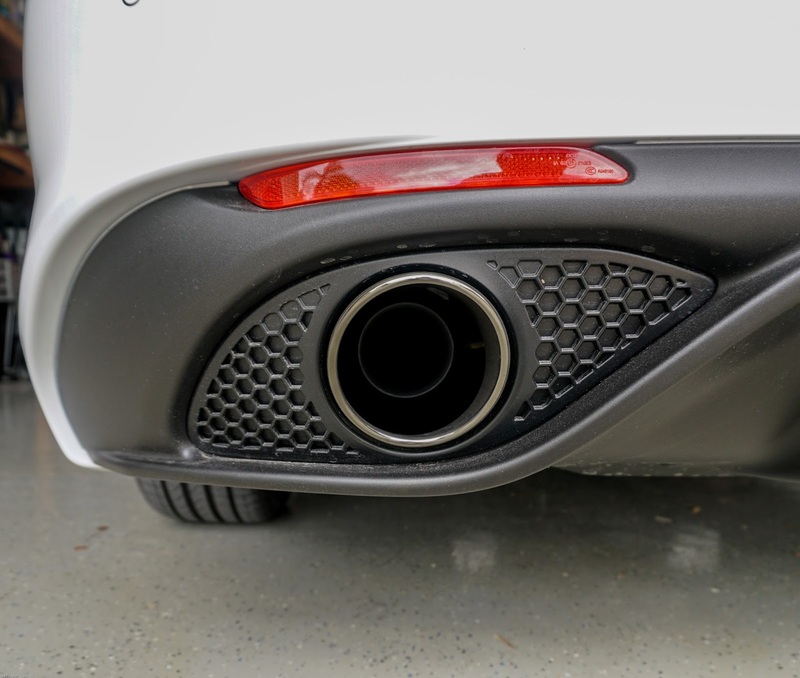 In other words this car feels right; powerful yet comfortable. 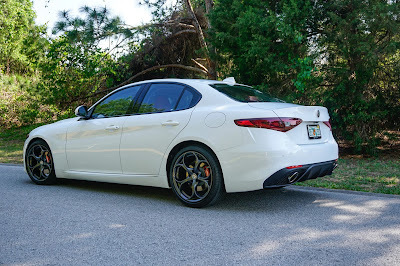 I bought this white jewel of a Giulia on April 12th and I've logged about 400 miles so far. I'll give you my thoughts from a visual viewpoint as well. 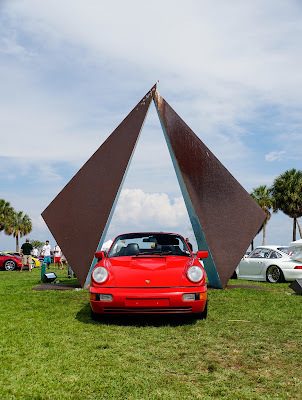 For the visual; the car is gorgeous in my opinion and several folks I've met agree. 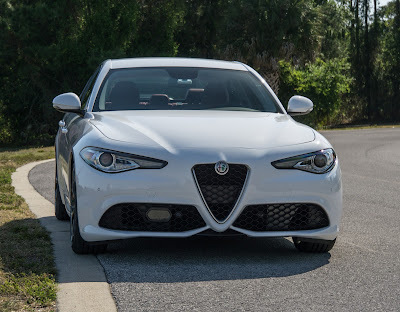 I took the Giulia Ti to DuPont Registry Cars and Coffee a few days after signing the 'adoption' papers for her and there were many thumbs up on her looks from young stud teenagers to old retired guys. I had a constant stream of admirers at the show telling me they also loved how the car looks. 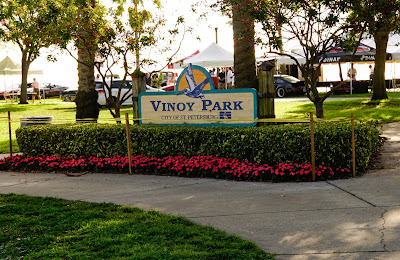 So before going any further- here's a shot I took in one of the parks near my home in Seminole, FL. 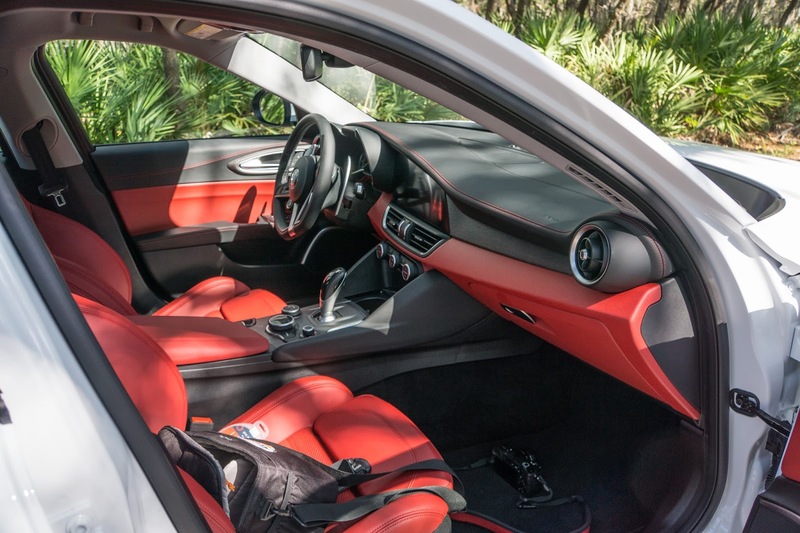 The white exterior over red interior is bold but tasteful and is highlighted by black leather trim with red stitching. 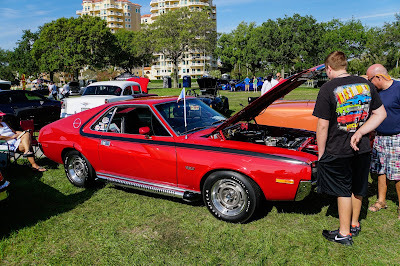 Several people at the show thought it was a knock out interior. Staying on the appearance summary- here's what I call the 'Curves of Giulia' in picture form. To demonstrate a few see below. 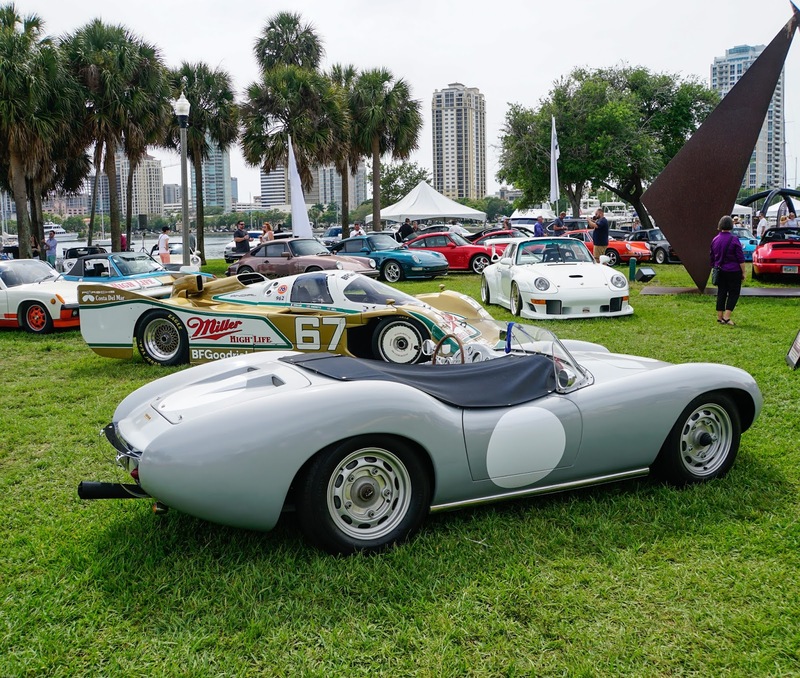 Every line on the car swoops and curves in all the right proportions and places to make it a rolling piece of art. 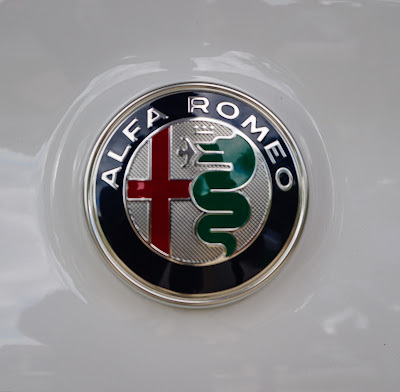 Even the Alfa emblem's green serpent curves in a coil position. And those wheels- they are a treasure for car lovers. One of the more unique logos in the industry. The car looks great but how does it drive? I am happy to report it drives as good as it looks. I traded my 2014 Porsche Cayman for this beauty and it is everything I could want in a performance car/ sports car. I call it my 4 door sports car. Am I crazy or is it worth trading a Porsche Cayman 981, with a PDK and a screaming 2.7 liter 6 cylinder boxer engine for a 4 door sports sedan with a 2.0 liter turbo four and an 8 speed automatic? 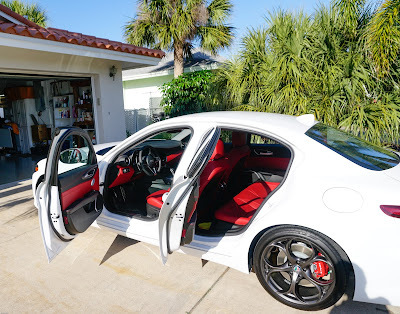 The Cayman was so good in many respects and it couldn't be beat for outright handling, but what won me over was the Alfa does everything the Cayman did and more. This Giulia's comfortable, quiet ride combines with a perfectly matched transmission to use all the power band. 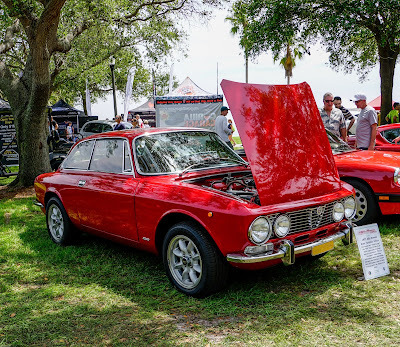 The Porsche had tall gearing requiring one to drive in sport mode or downshift a gear or two to stay in the power band even around town but the Alfa seems to know how to keep you there effortlessly. 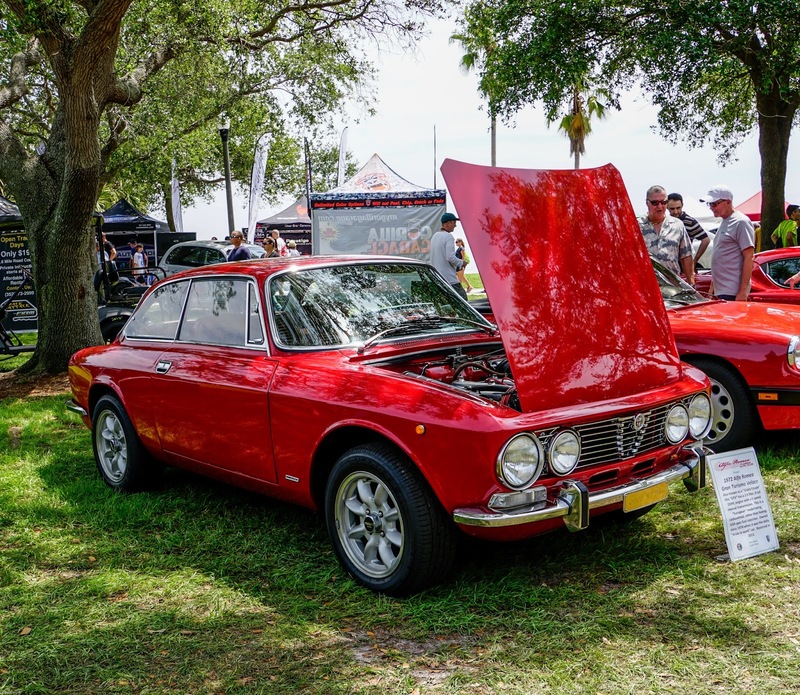 The reason is the Alfa's superior torque, a turbocharger, and better gear matching through an 8 speed ZF derived transmission. Taking a look at the torque figures, the Alfa's 306 lb-ft vs the Cayman's 213 lb-ft it shows there's no contest. This is a big part of the Alfa's 'fun to drive' factor compared to the Cayman's driving experience. 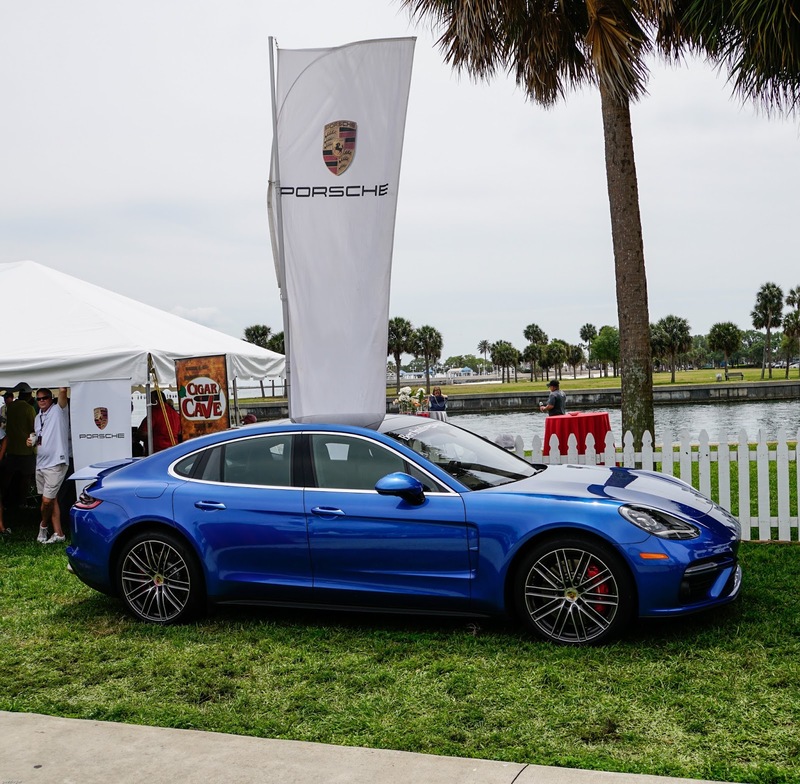 The Porsche has a higher top speed at 165 mph vs 149 mph, but how often are you using that? Unquestionably the Porsche has better cornering ability, but when you squeeze the trigger aka accelerator, the Alfa is gone before respected competitors get going including the base Cayman. My conclusion as to why I liked the car's overall driving pleasure is backed up by the latest Motor Trend comparison test (June 2017) with rivals like the Audi A4 2.0T, Cadillac ATS 2.0T, Mercedes C300, Jaguar XE 25t, and the Lexus200t F Sport. 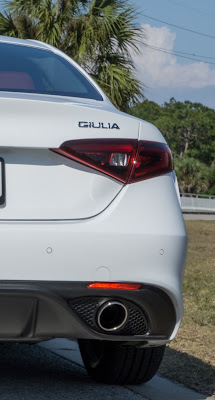 My version, the Giulia Ti beat all but the Audi 0-60 doing it in 5.1 seconds but more important, it beat ALL of them going from 0-80, which is 90% of where we drive. 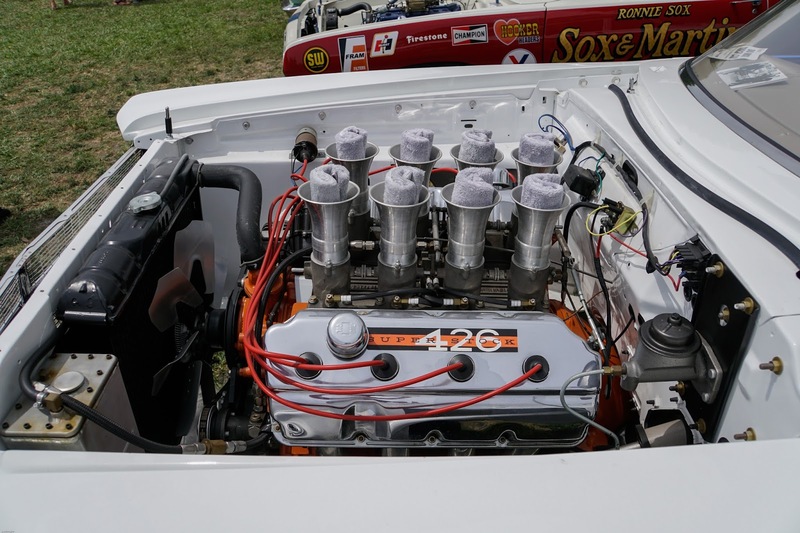 In fact it crushed many of the rivals by over 2 full seconds on the 0-80 test! That's what proper gearing and torque matching does. I know Porsche is entering a new chapter with its Boxster/ Cayman 718 using a new torquey turbo four cylinder and the reports are favorable but the Alfa Romeo was already there with its new aluminum 2.0 turbo last year. Torque trumps horsepower in everyday driving, or at least that's what I believe. But torque isn't the only story here. There's more- throw in one of the best steering cars out there and you have what puts the icing on the cake for how the car 'feels'. The Giulia offers wonderful feedback from the road with a lighter than expected turning effort set up with an incredibly quick steering ratio. 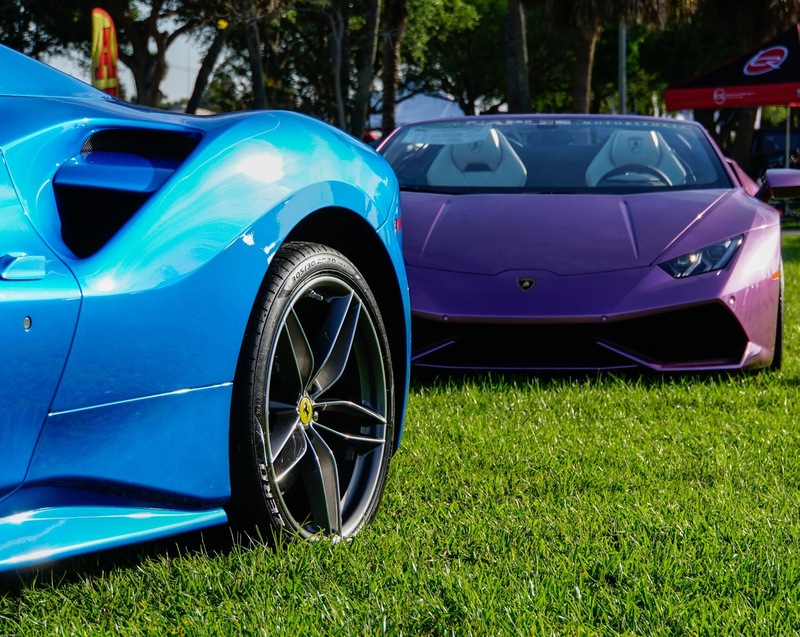 Topping that off, you have a beautiful wheel that you are holding. With it's flat bottom, leather wrapping and On/Off mounted power button it is very Ferrari like. And the paddle shifters are nice large metal instruments fit for a surgeon straight from Ferrari's play book. 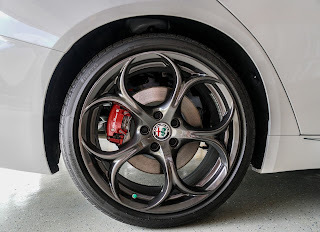 Last but not least is the suspension- a double wishbone affair up front with all the lessons Alfa has learned in years of racing bread into the rear. With this race inspired suspension the driving 'feel' is of a car much lighter, like it wants to dance. 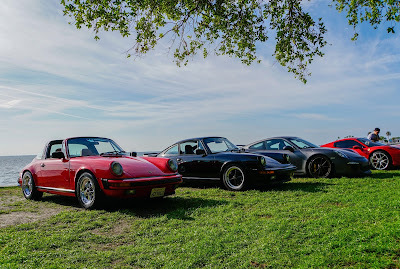 The seat of your pants experience in the twistees reminds me of my old BMW 2002, with the added bonus of body hugging sport seats trimmed in red leather! So if you want a quiet and comfortable ride that handles curves with ease and goes like hell, the Giulia Ti will not let you down. And if you need more speed you can step up to the V6 505 HP Quadrifoglio. 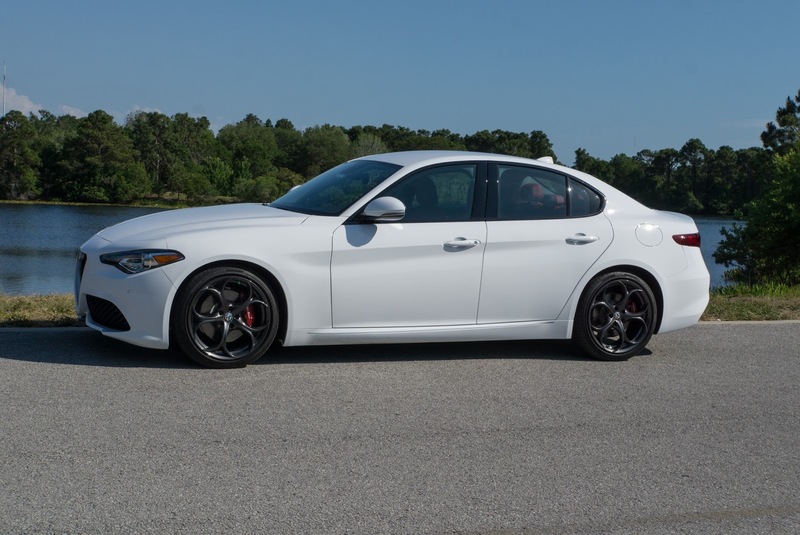 All around the Giulia Ti 280 HP is the total package for the price and I'd suggest a test drive to see! 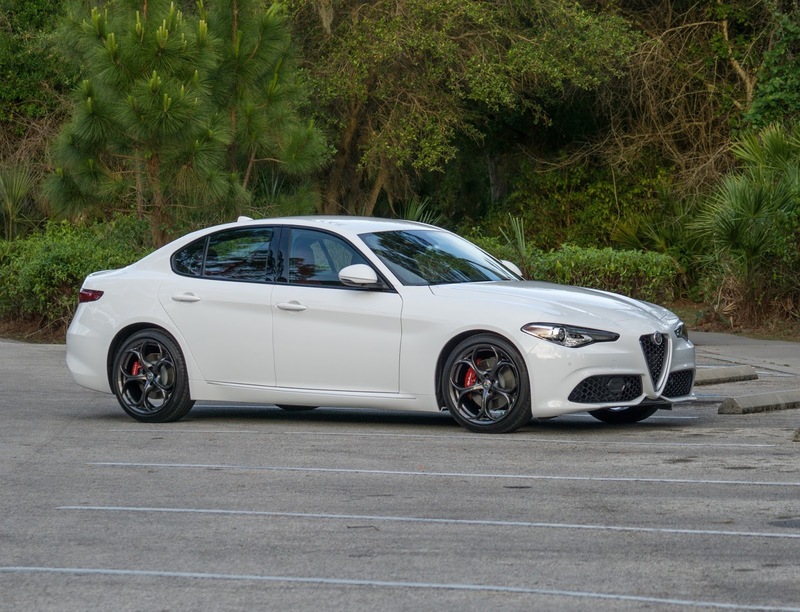 Writer's Note- Read the June issue of Motor Trend- First time I've seen the base model of a new car (This Giulia Ti ) AND its top model (The Giulia Quadrifoglio) win in two different comparison tests! 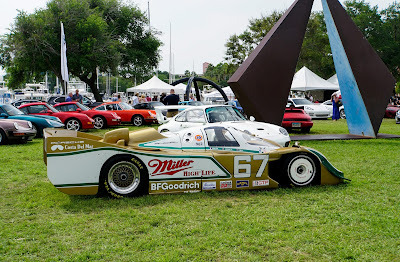 Here's a few more pictures of this beautiful masterpiece. 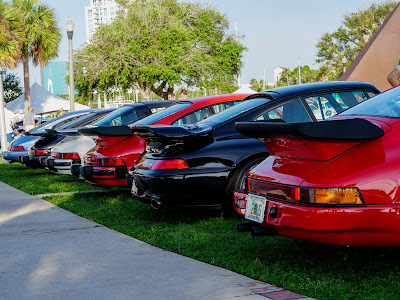 Here are some highlight photos from another magnificent show in St. Petersburg, Florida. 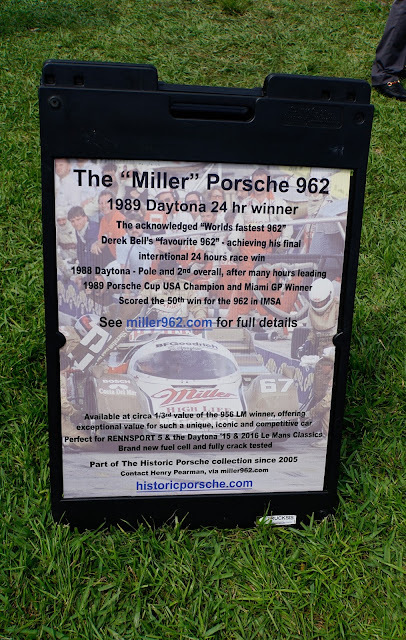 The main presenting sponsor was Bert Smith Euro Collection, and specifically Porsche. 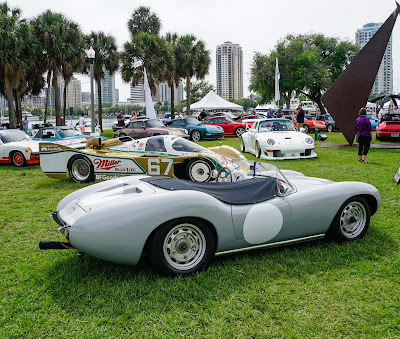 You will see in these pictures some beautiful Porsches from street cars to race cars and several other exotic brand cars to add spice to the mix. 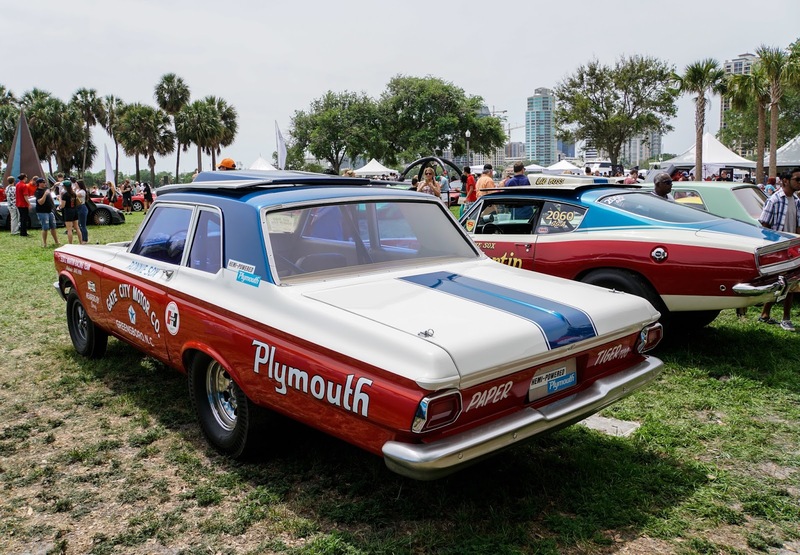 Feast your eyes on this rolling artwork while enjoying some distinct American muscle from the past. This collection only scratches the surface of what was there. 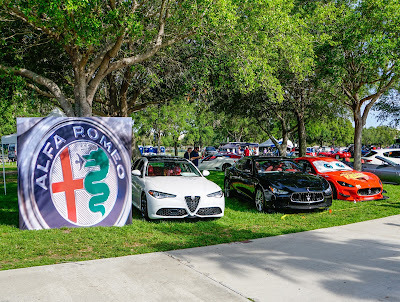 I have a special shout out to Maserati- Alfa Romeo of St. Petersburg. 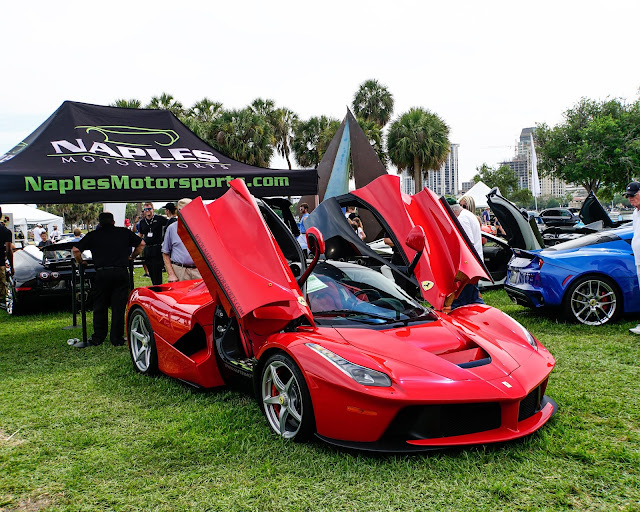 Great to see you at the show and happy to see you are in the Tampa Bay market in our back yard! I'm speaking as former president of the Pinellas Park- Gateway Chamber of Commerce. 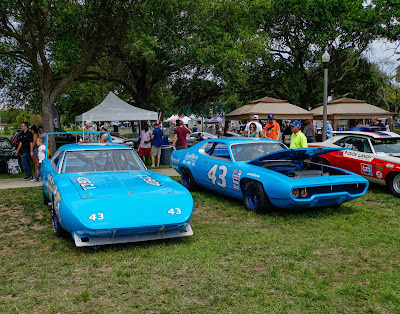 If you have not attended a Festivals of Speed, I highly recommend it. 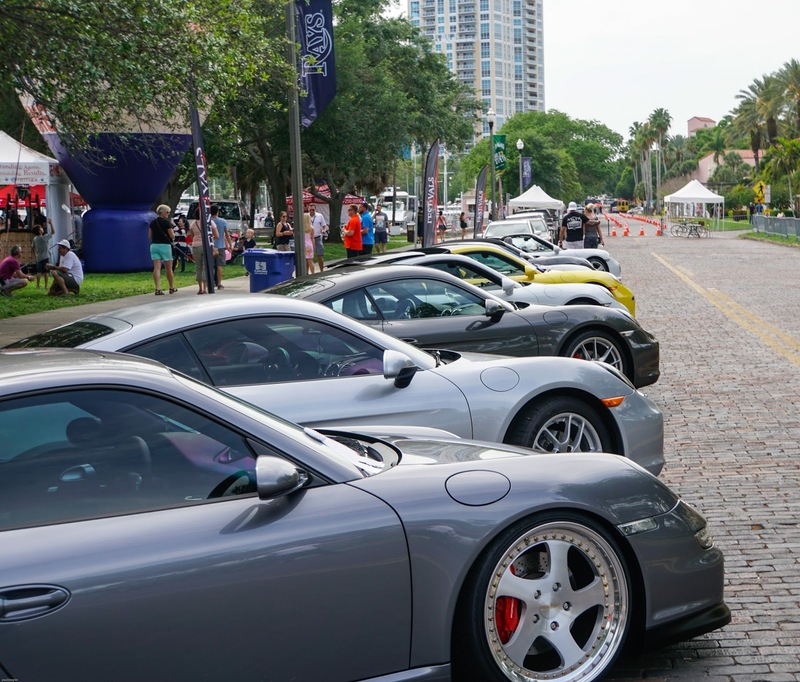 Special thanks to the Porsche Club of America members who brought your favorite cars to the show and those that joined in on the boulevard by the Vinoy for the Porsches on Parade Wash & Shine. Not Tray Tables For Your Lunch! 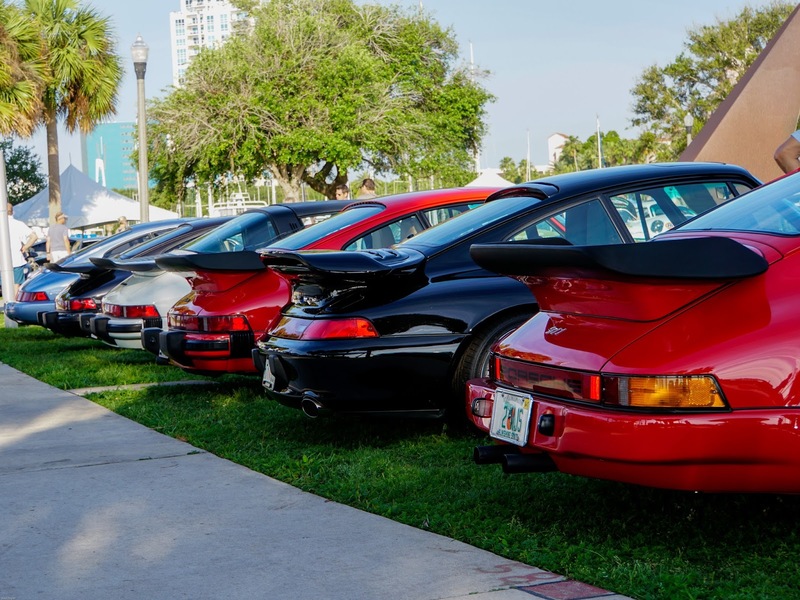 Plan on coming to Festivals of Speed Next Year!